An intergenerational ceremony to celebrate Indigenous beauty and survival. 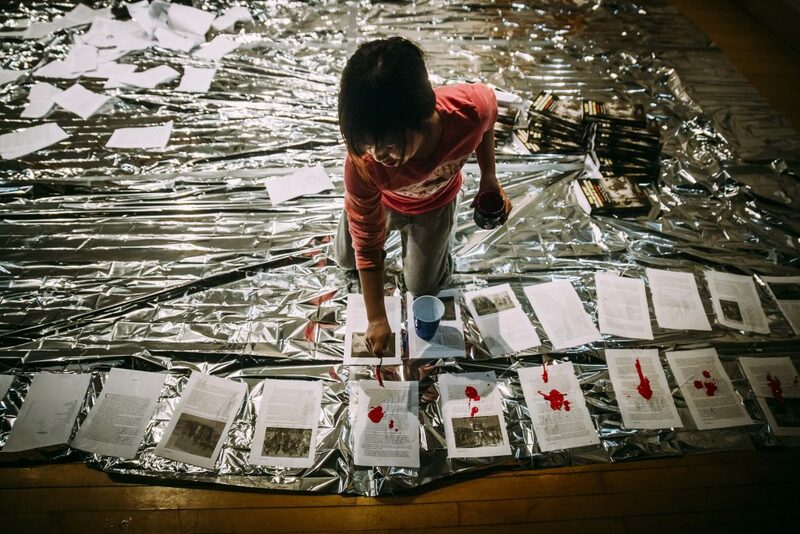 A broadside aimed at the Canadian government as it continues to perpetuate the status quo to the detriment of Indigenous peoples, this installation-performance by Lara Kramer and Émilie Monnet portrays their strength and resilience. A response to constantly broken promises. 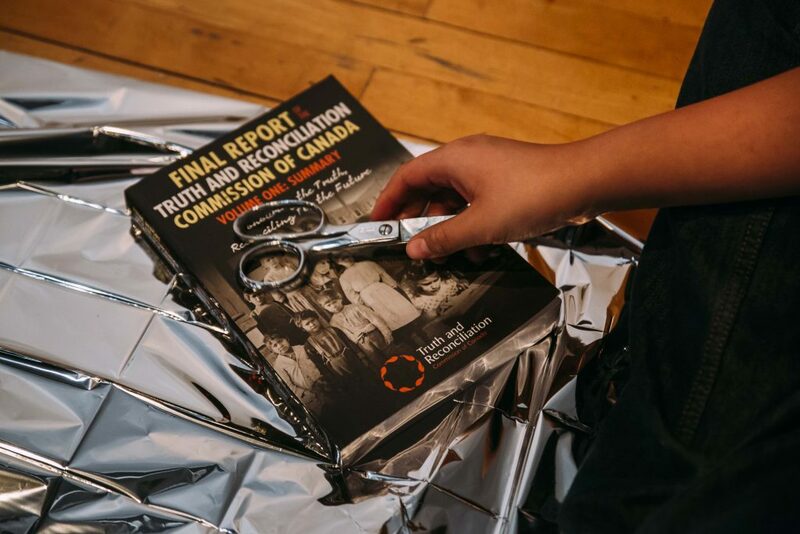 A child rips up, one by one, the 600 pages of the report by the Truth and Reconciliation Commission of Canada, as his grandmother, the visual artist Glenna Matoush, a survivor of the residential school system, looks on. Red paint, glue, jingling coins. The two artists consulted other members of their community, listening as they told their heartrending stories. 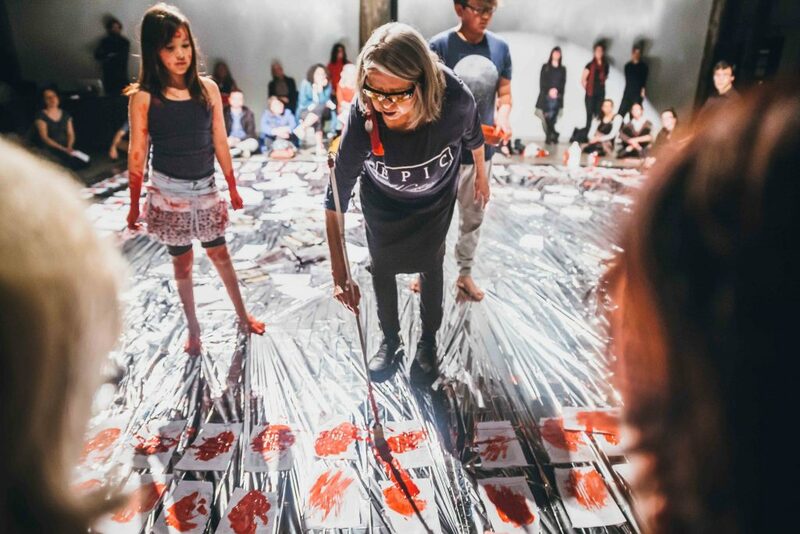 With the slowness of a collective ritual, This Time Will Be Different creates a space for dialogue and for listening. An offering of space where stories are not set pieces written in books, but are exchanges of gestures and actions, bodies and souls engaged in a healing process, a place where people come together. 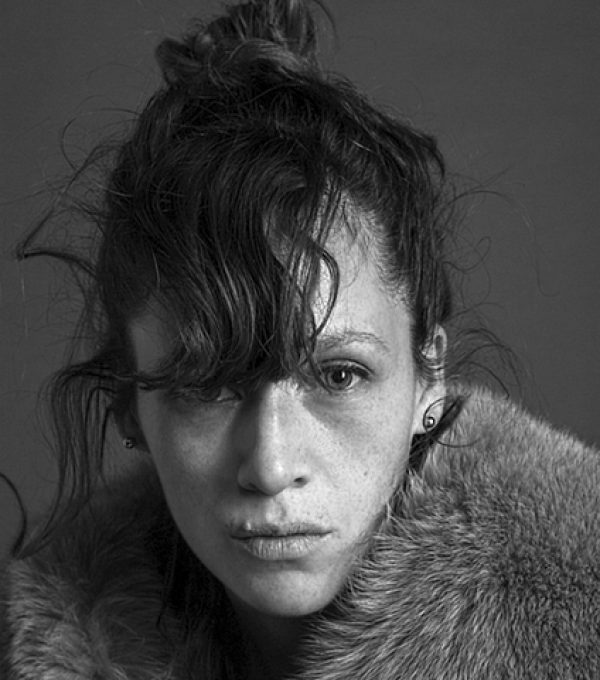 Lara Kramer is a Montreal-based performer, choreographer and multidisciplinary artist of Cree, Ojibwe and Mennonite heritage. Her work has been presented across Canada and in Australia, and deals with the scars and aftermath of cultural genocide. 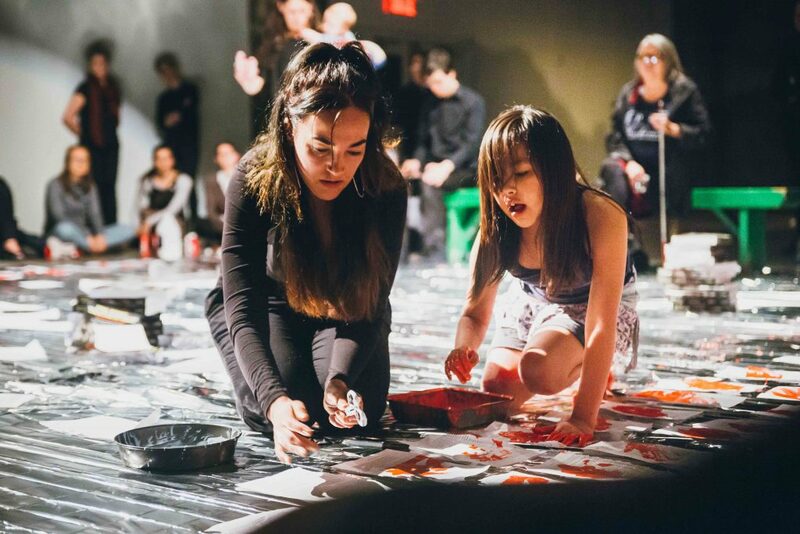 After Fragments (2009), inspired by her mother’s stories about residential schools, and Native Girl Syndrome (2013), which focused on the internalization of trauma among First Nations women, in 2017 she presented at the FTA a twofold project: the performance Windigo and the installation piece Phantom Stills & Vibrations, which probed the repercussions of three generations of her family being forced to live in residential schools. 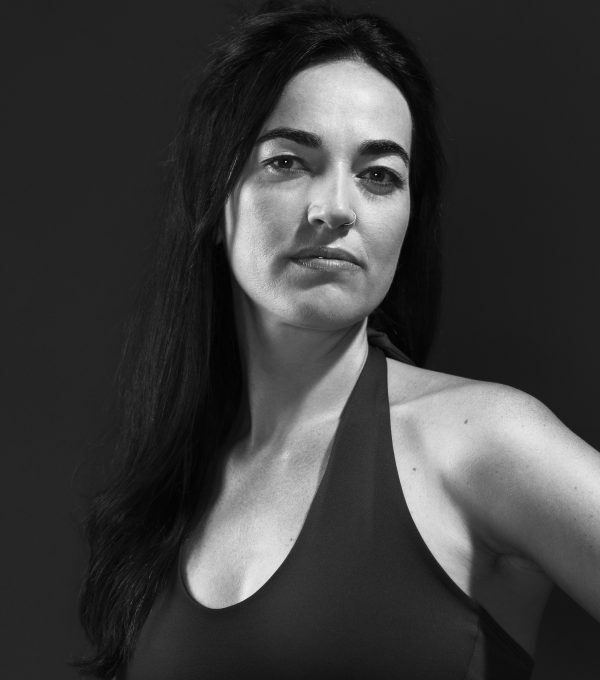 This Time Will Be Different is the first collaboration between Lara Kramer and Émilie Monnet. Integrating interviews conducted with other individuals in their community as well as their own voices, they create a performance combining many generations, giving voice to the forgotten, re-appropriating a history of colonization. Earlier versions have been presented at MAI then at OFFTA in 2017. 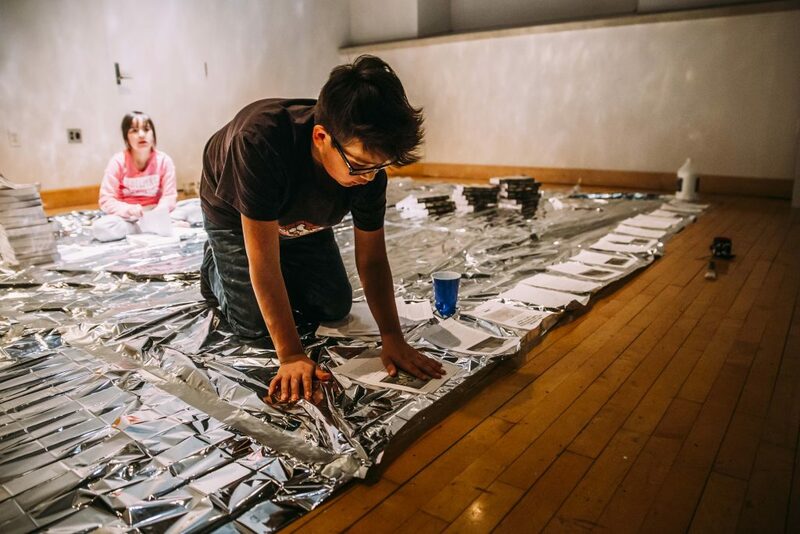 Born from an Anishinaabe mother and a French father, Émilie Monnet’s practice is at the intersection of theatre, performance and media arts, and centres on questions of identity, memory, history and transformation. In 2011 she founded her company, Onishka, to create bridges between Indigenous artists and communities around the world. In 2016 she founded Indigenous Contemporary Scene, a platform for the presentation of live arts by Indigenous artists as well as for critical conversations that are Indigenous-led. The first Indigenous Creators Exchange was presented at FTA in 2018. 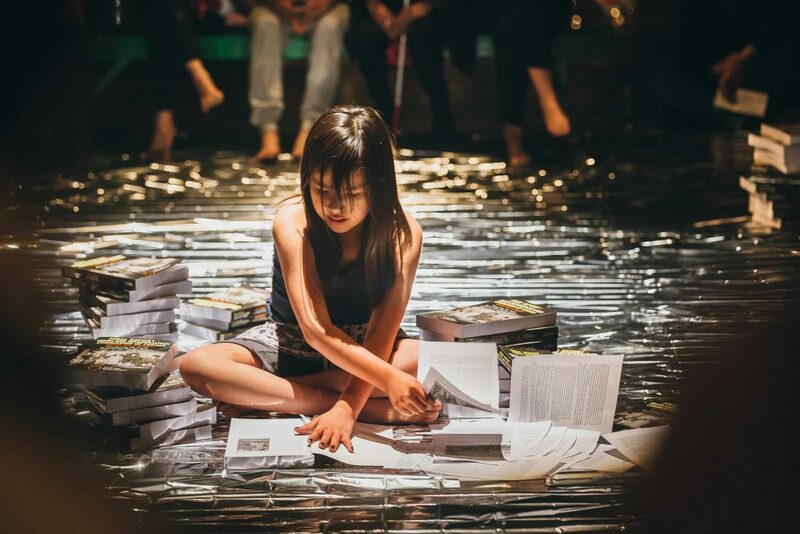 Artist in residence at the Centre du Théâtre d’Aujourd’hui, in 2018 she presented Okinum, an immersive theatrical experience that employs circular, spellbinding staging. 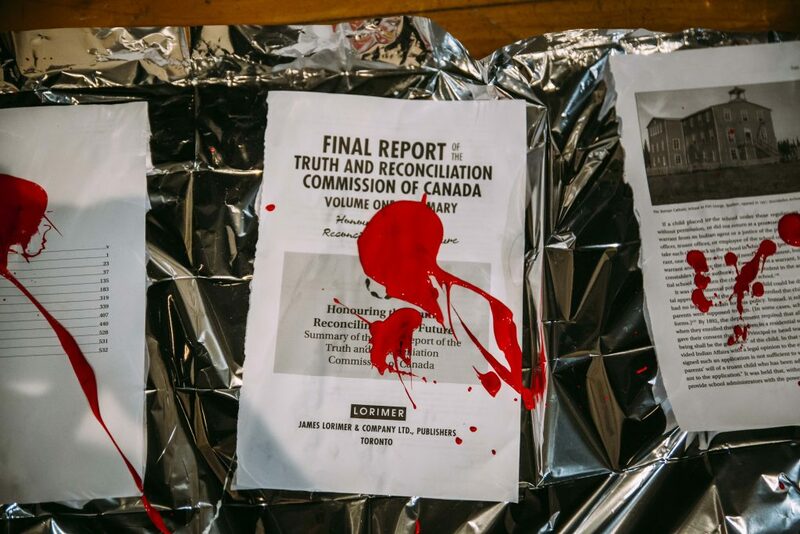 During the performance a child rips out pages from the report published by the Truth and Reconciliation Commission of Canada. Why that gesture? Émilie Monnet: That gesture, repeated over and over, echoes the repetitive history of commissions and inquiries organized by the Canadian government with regard to Indigenous Peoples. After the Royal Commission on Aboriginal Peoples (RCAP) – established in 1991 right after the Oka crisis of 1990 – submitted its report in 1996, two other national commissions of inquiry were created: the Truth and Reconciliation Commission (TRC), which concluded in 2016, and more recently the National Inquiry into Missing and Murdered Indigenous Women and Girls, which is still ongoing. The TRC’s calls to action offer great suggestions for establishing new relations from nation to nation, and for improving the living conditions of Indigenous peoples. Such changes are necessary if we really want to talk about reconciliation. In comparing the recommendations made by the RCAP, it is clear that they are talking about the same things. Twenty years stand between those two commissions; two decades have passed and very little has changed. The government commits itself to doing something and makes promises, but it’s nothing but words unsupported by actions, nothing but dust in the wind. The idea of ripping up the report is linked to the repetition of words, of printed documents that merely assuage the government’s conscience, and of course by no means results in any real reparations or rectification. The torn pages testify to their futility. It’s nothing but paper, nothing that will offer concrete change to people’s lives. You denounce the “reconciliation industry”. How has it become an industry? Lara Kramer: Our job is to remain sceptical and question language and its underpinnings, as well as the language used by the government. When mainstream culture endorses the status quo, there is no pressing need to change it. To execute a paradigm shift, settler culture would have to fundamentally reject large parts of itself. Erasure of Indigenous culture has been and continues to be prolific in Canada. Seeing and working among other colonial systems has made me feel how much more disastrous Canada is. It is an apartheid system. The current notion of reconciliation is a form of continued erasure of Aboriginal title to land. This is the conflict I feel that I’m in, in relation to my work and daily life. I’m up against multiple forms of erasure. I’m not reconciling myself to Canada; Canada has to reconcile itself to us. É. M.: For residential school survivors, the process of applying for compensation for the physical, emotional and sexual abuse suffered at the schools has been, in many cases, a traumatic experience. They had to testify and, based on the evidence presented and the gravity of the abuse, they obtained a certain number of points to be converted into financial compensation. Instead of an approach to reparations and redress that is holistic and that might even lead to healing, the government opted for a monetary scale of values based on the level of trauma experienced. 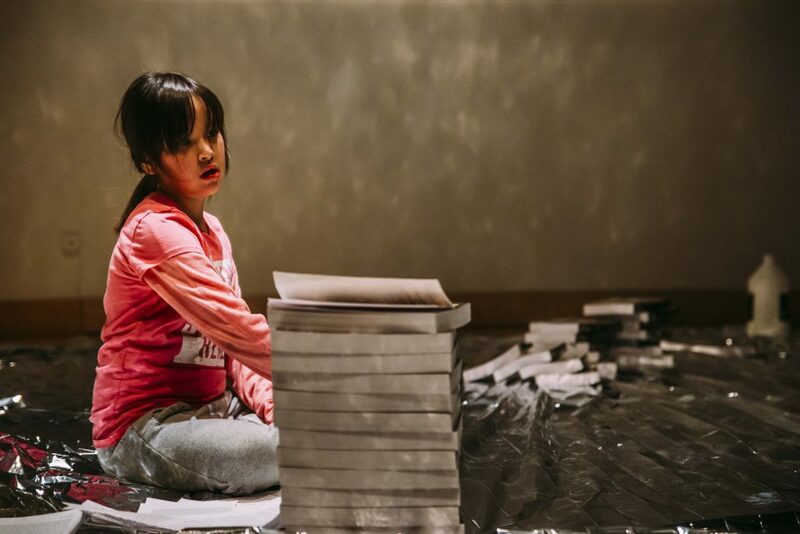 Our performance offers a prism for a better understanding of that reality and its inter-generational impacts. We want to start a dialogue. Creating one commission after another is a way of having us believe in the government’s good faith, a way to maintain a certain status quo, to control us. How can we talk about reconciliation if the living conditions for Indigenous children continue to deteriorate? The piece is an interview-based collective testimonial consisting of several voices. Tell us about this intimate, collective form. É. M.: The performance is an immersive sound installation, but is also a space for communion, for collective sharing. We recorded several conversations with the visual artist Glenna Matoush, for whom being part of this project has become a personal and creative response to the fact that the Government of Canada refused to give her any compensation for the years she spent in Indian residential schools. Her comments are interspersed with video clips and critiques by Indigenous thinkers? Glenna and her grandchildren are onstage with us. Together, we animate the physical space, transforming it into one of positive energy. The presence of the children adds a very human element to the experience. L. K.: It’s a story where all collaborators are involved in the telling. It is not solely our artistic vision, our creation, but rather a collective position that aims to bring together a community. It becomes multidimensional: the manipulation of objects, the vocabulary, the symbolism, the voices. All of this forms a dialogue that is in constant flux. We are not static nations. It’s a way of sharing the beauty of our survival through the telling of our own stories that embody the past, present and future. While the government decides that we have six years to record our past, we find power in continuing to tell our story. A story that breathes and lives, that continues to find new connections, other voices, that isn’t a closed chapter of our history. The echo of our conversations, our collective testimonies, opposes the static history of books.